A 90-minute hands-on workshop dedicated to the art of restoring antique prints and books. This class takes you on a fascinating journey behind the scenes of papermaking, sharing traditional techniques developed over centuries and brought to perfection in Florence. Take on the role of artisan as you learn how to conserve and restore old prints and to make fine paper, as well as many intriguing anecdotes about this amazing art form. 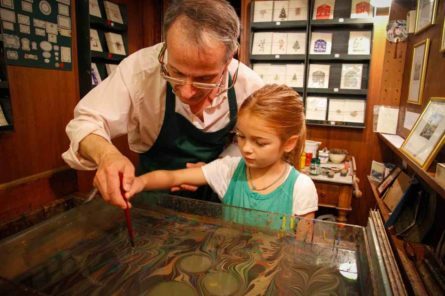 This Florence papermaking workshop is fun and informational for the whole family, allowing children to participate in a fun experience that also ties into traditional Florentine culture.